Dubai, UAE May 29, 2013: Dubai continues to climb the ranks as an international travel destination, according to MasterCard’s third annual Global Destination Cities Index. The UAE’s travel hub has consistently advanced its position since the inception of the Index in 2011, ranking ninth in its launch year, eighth in 2012 and seventh in the 2013 edition. Dubai is set to be the seventh most popular city globally in terms of inbound international visitors in 2013, outranking cities such as Hong Kong, Barcelona, Milan and Rome. At 10.9 percent, Dubai (along with Bangkok) shows the strongest growth in arrival numbers among the top ten global markets, with 9.89 million overnight visitors expected this year. Dubai also ranks eighth globally by international overnight visitor spend, with an estimated US$10.4 billion to be spent in the city during 2013. The Index indicates that if all top 10 destination cities maintain their current rates of growth in the next few years, Dubai will surpass Singapore and New York in 2016 and Paris in 2017 in terms of international visitor arrivals. The top five origin cities for Dubai are London, Kuwait, Paris, Frankfurt and Doha, and all of these are expected to grow strongly in visitor numbers in 2013. London visitors are expected to increase by 26.3 percent in 2013, followed by those from Paris (16.9 percent), Kuwait (12.4 percent), Doha (9.5 percent) and Frankfurt (9.4 percent). “While the Middle East and Africa’s top ten cities lineup is exactly the same as in 2012, there is a striking difference in how far Dubai is ahead of the other cities. Its international arrival number is almost twice that of Riyadh in second rank, and about four times as high as the third-ranked Johannesburg,” said Dr. Yuwa Hedrick-Wong, Global Economic Advisor for MasterCard and the author of the report. The Middle East and Africa’s top five destination cities by international overnights visitors are Dubai (9.9 million), Riyadh (5.0 million), Johannesburg (2.5 million), Amman (2.4 million) and Lagos (2.2 million). Among the Middle East and Africa’s top ten, Abu Dhabi (ranked seventh with 1.7 million visitors) showed the strongest growth rate, with an anticipated 16.1 percent increase in arrivals. The Index highlights that, if these rates are maintained in the coming years, Abu Dhabi will overtake Lagos in 2016 and match Johannesburg by 2017. The UAE’s capital also ranked sixth among the global top 20 with regard to growth rates of international visitor arrivals between 2009 and 2013, with growth of 96.8 percent during this period. Within the Middle East and Africa, Dubai ranks first by international overnight visitor spend, followed by Riyadh and Beirut. Beirut’s position in this ranking is remarkable, given that Lebanon’s capital is not among the top ten cities in the region by visitor arrivals. The US$2.8 billion expected to be spent in the capital this year reflects the attraction that the city holds for more affluent consumers. “The inauguration of the Index in 2011 has helped us record Dubai’s remarkable growth story, and the Index has proven to be a trusted barometer of the market’s performance in the global landscape. Home to the world’s second busiest airport, Dubai has gone from strength to strength, and continues to develop its offerings as it plans to draw even more visitors in the coming years,” shared Raghu Malhotra, Division President, Middle East and North Africa, MasterCard. “The global travel sector has been supported by the significant developments in the electronic payments sphere, and we see more consumers taking advantage of programs and offers that make international travel more achievable and hassle free. At MasterCard, we will continue to work with our partners to bring travelers safe and meaningful payment options to suit their lifestyle needs as we continue to contribute towards the growth of global economy,” Malhotra concluded. Globally, Bangkok outranked London as 2013’s number one destination city with only about 25,000 visitors separating the two – a difference of about one percent. 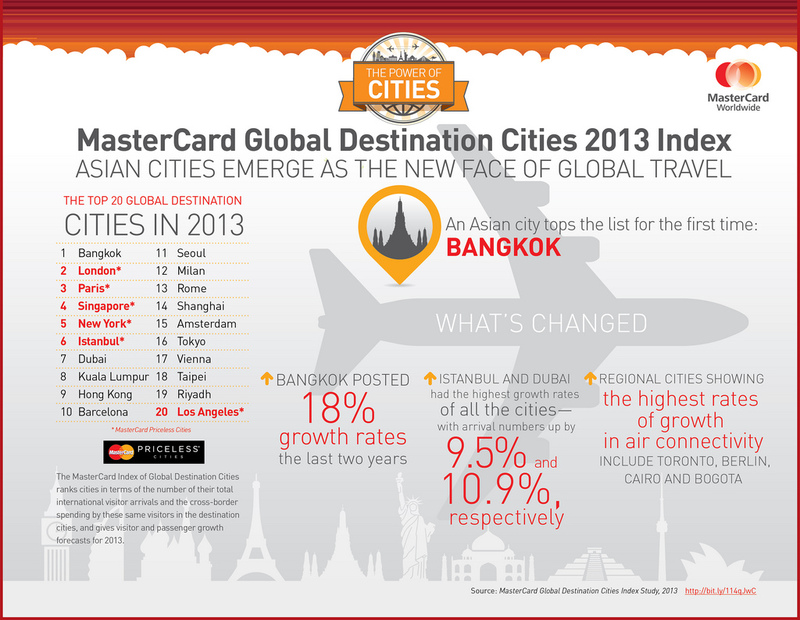 The Index predicts that Bangkok will draw the highest international visitor numbers in 2013, ahead of London, Paris, Singapore, and New York.